As with many other tick-borne diseases, tularemia may, early in its course, have a nonspecific presentation. Moreover, many individuals may not be aware of or recall having been bitten by a tick or fly. These factors illustrate the importance of routinely including queries regarding travel, work, and animal and arthropod exposure in the history when presented with a patient who potentially has tularemia. Children infected with tularemia typically have a clinical presentation similar to that of adults. However, children have been reported to have fever, pharyngitis, hepatosplenomegaly, and constitutional symptoms more often than do adult patients. As many as 20% of patients with tularemia have a rash, which may begin as blotchy, macular, or maculopapular and progress to pustular. Erythema nodosum and erythema multiforme are rare. In this form of tularemia, F tularensis usually enters the body via a scratch or abrasion and then spreads lymphatically, typically causing painful regional lymphadenopathy and an ulcerated skin lesion. 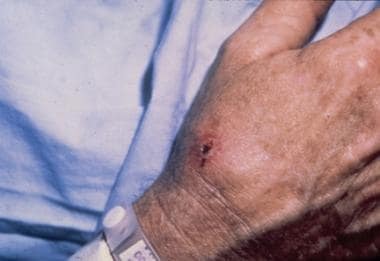 Eschar on thumb and under thumbnail at the site of a rabbit bite in a patient with tularemia. Axillary bubo in a patient with tularemia. 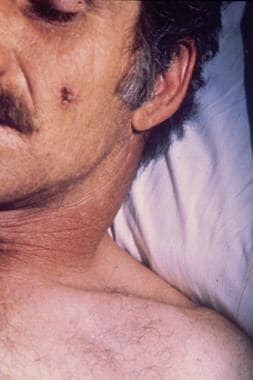 Ulceroglandular type of tularemia on the face. Courtesy of Dr Hon Pak. Primary tularemia pneumonia, an uncommon condition, occurs after inhalation of F tularensis. Rarely acquired naturally, pneumonic tularemia may develop in laboratory workers. Patients often have pneumonia. Diagnosis is difficult because ulcers and lymphadenopathy are usually absent. Other possible manifestations include acute renal failure, hepatomegaly, abnormal liver function, and rhabdomyolysis. Patients with tularemia have fever and possibly tender hepatosplenomegaly. As many as 20% of patients have a rash, which may begin as blotchy, macular, or maculopapular and progress to pustular. Erythema nodosum and erythema multiforme rarely occur. This form is characterized by an ulcer at the site of F tularensis entry through the skin. The ulcer varies with the vector. It usually begins as a tender papule that eventually ulcerates and has a sharply demarcated border with a yellowish exudate. Initially, the base of the ulcer also has a yellowish exudate, but this subsequently turns black. Regional lymphadenopathy develops, and the lymph nodes are usually edematous and tender. They can become fluctuant and may drain spontaneously. Exudative or membranous pharyngotonsillitis with regional adenopathy may be observed. Chest examination findings may be normal in tularemic pneumonia, or rales may be present in the affected lung fields. Evans ME, Gregory DW, Schaffner W, McGee ZA. Tularemia: a 30-year experience with 88 cases. Medicine (Baltimore). 1985 Jul. 64(4):251-69. [Medline]. Gelfand MS, Slade W, Abolnik IZ. Tularemia serology: Differentiating true-positive and false-positive titers. Inf Dis Clin Pract. 1992. 1:105-8. Tärnvik A, Chu MC. New approaches to diagnosis and therapy of tularemia. Ann N Y Acad Sci. 2007 Jun. 1105:378-404. [Medline]. Matero P, Hemmilä H, Tomaso H, Piiparinen H, Rantakokko-Jalava K, Nuotio L, et al. Rapid field detection assays for Bacillus anthracis, Brucella spp., Francisella tularensis and Yersinia pestis. Clin Microbiol Infect. 2011 Jan. 17(1):34-43. [Medline]. [Guideline] Finnish Medical Society Duodecim. Tularaemia. EBM Guidelines. Evidence-Based Medicine [Internet]. Helsinki, Finland: Wiley Interscience. John Wiley & Sons; Apr 27 2008. [Full Text]. Tularemia--United States, 1990-2000. MMWR Morb Mortal Wkly Rep. 2002 Mar 8. 51(9):181-4. [Medline]. Feldman KA, Enscore RE, Lathrop SL, Matyas BT, McGuill M, Schriefer ME, et al. An outbreak of primary pneumonic tularemia on Martha's Vineyard. N Engl J Med. 2001 Nov 29. 345(22):1601-6. [Medline]. Reintjes R, Dedushaj I, Gjini A, Jorgensen TR, Cotter B, Lieftucht A, et al. Tularemia outbreak investigation in Kosovo: case control and environmental studies. Emerg Infect Dis. 2002 Jan. 8(1):69-73. [Medline]. [Full Text]. Adams D, Fullerton K, Jajosky R, Sharp P, Onweh D, Schley A, et al. Summary of Notifiable Infectious Diseases and Conditions - United States, 2013. MMWR Morb Mortal Wkly Rep. 2015 Oct 23. 62 (53):1-122. [Medline]. Pedati C, House J, Hancock-Allen J, Colton L, Bryan K, Ortbahn D, et al. Notes from the Field: Increase in Human Cases of Tularemia - Colorado, Nebraska, South Dakota, and Wyoming, January-September 2015. MMWR Morb Mortal Wkly Rep. 2015 Dec 4. 64 (47):1317-8. [Medline]. Centers for Disease Control and Prevention (CDC). Tularemia - United States, 2001-2010. MMWR Morb Mortal Wkly Rep. 2013 Nov 29. 62 (47):963-6. [Medline]. CDC. Tularemia (Francisella tularensis) 1999 Case Definition. cdc.gov. Available at http://wwwn.cdc.gov/nndss/conditions/tularemia/case-definition/1999/. Accessed: August 27, 2018. Tarnvik A, Berglund L. Tularemia. Eur Respir J. 2003. 21:361-73. Yee D, Rhinehart-Jones TR, Elkins KL. Loss of either CD4+ or CD8+ T cells does not affect the magnitude of protective immunity to an intracellular pathogen, Francisella tularensis strain LVS. J Immunol. 1996 Dec 1. 157(11):5042-8. [Medline]. Maurin M, Pelloux I, Brion JP, Del Banõ JN, Picard A. Human tularemia in France, 2006-2010. Clin Infect Dis. 2011 Nov. 53(10):e133-41. [Medline]. Pohanka M, Skládal P. Bacillus anthracis, Francisella tularensis and Yersinia pestis. The most important bacterial warfare agents - review. Folia Microbiol (Praha). 2009. 54(4):263-72. [Medline]. Dennis DT, Inglesby TV, Henderson DA, Bartlett JG, Ascher MS, Eitzen E, et al. Tularemia as a biological weapon: medical and public health management. JAMA. 2001 Jun 6. 285(21):2763-73. [Medline]. Egan JR, Hall IM, Leach S. Modeling inhalational tularemia: deliberate release and public health response. Biosecur Bioterror. 2011 Dec. 9(4):331-43. [Medline]. [Full Text]. Chaudhury S, Abdulhameed MD, Singh N, Tawa GJ, D'haeseleer PM, Zemla AT, et al. Rapid Countermeasure Discovery against Francisella tularensis Based on a Metabolic Network Reconstruction. PLoS One. 2013. 8(5):e63369. [Medline]. [Full Text]. Hepburn MJ, Friedlander AM, Dembek ZF. Tularemia. Textbook of Military Medicine: Medical Aspects of Biological Warfare. Washington, DC: Borden Institute, US Army; 2008. 167-84. Geyer SJ, Burkey A, Chandler FW. Tularemia. Connor DH. Pathology of Infectious Diseases. Stamford, CT: Appleton & Lange; 1997. 869-73. Koskela P, Salminen A. Humoral immunity against Francisella tularensis after natural infection. J Clin Microbiol. 1985 Dec. 22(6):973-9. [Medline]. [Full Text]. Elkins KL, Bosio CM, Rhinehart-Jones TR. Importance of B cells, but not specific antibodies, in primary and secondary protective immunity to the intracellular bacterium Francisella tularensis live vaccine strain. Infect Immun. 1999 Nov. 67(11):6002-7. [Medline]. [Full Text]. Salerno-Goncalves R, Hepburn MJ, Bavari S, Sztein MB. Generation of heterogeneous memory T cells by live attenuated tularemia vaccine in humans. Vaccine. 2010. 28:195-206. Tularemia--Oklahoma, 2000. MMWR Morb Mortal Wkly Rep. 2001 Aug 24. 50(33):704-6. [Medline]. Chase JC, Bosio CM. The presence of CD14 overcomes evasion of innate immune responses by virulent Francisella tularensis in human dendritic cells in vitro and pulmonary cells in vivo. Infect Immun. 2010 Jan. 78(1):154-67. [Medline]. [Full Text]. Green SJ, Nacy CA, Schreiber RD, Granger DL, Crawford RM, Meltzer MS, et al. Neutralization of gamma interferon and tumor necrosis factor alpha blocks in vivo synthesis of nitrogen oxides from L-arginine and protection against Francisella tularensis infection in Mycobacterium bovis BCG-treated mice. Infect Immun. 1993 Feb. 61(2):689-98. [Medline]. [Full Text]. Conlan JW, North RJ. Early pathogenesis of infection in the liver with the facultative intracellular bacteria Listeria monocytogenes, Francisella tularensis, and Salmonella typhimurium involves lysis of infected hepatocytes by leukocytes. Infect Immun. 1992 Dec. 60(12):5164-71. [Medline]. [Full Text]. Meibom KL, Barel M, Charbit A. Loops and networks in control of Francisella tularensis virulence. Future Microbiol. 2009 Aug. 4(6):713-29. [Medline]. Johansson A, Göransson I, Larsson P, Sjöstedt A. Extensive allelic variation among Francisella tularensis strains in a short-sequence tandem repeat region. J Clin Microbiol. 2001 Sep. 39(9):3140-6. [Medline]. [Full Text]. Conlan JW, KuoLee R, Shen H, Webb A. Different host defences are required to protect mice from primary systemic vs pulmonary infection with the facultative intracellular bacterial pathogen, Francisella tularensis LVS. Microb Pathog. 2002 Mar. 32(3):127-34. [Medline]. Cowley SC. Editorial: Proinflammatory cytokines in pneumonic tularemia: too much too late?. J Leukoc Biol. 2009 Sep. 86(3):469-70. [Medline]. Sharma J, Li Q, Mishra BB, Pena C, Teale JM. Lethal pulmonary infection with Francisella novicida is associated with severe sepsis. J Leukoc Biol. 2009 Sep. 86(3):491-504. [Medline]. [Full Text]. Washburn AM, Fullilove RE, Fullilove MT, Keenan PA, McGee B, Morris KA, et al. Acupuncture heroin detoxification: a single-blind clinical trial. J Subst Abuse Treat. 1993 Jul-Aug. 10(4):345-51. [Medline]. Hauri AM, Hofstetter I, Seibold E, Kaysser P, Eckert J, Neubauer H, et al. Investigating an airborne tularemia outbreak, Germany. Emerg Infect Dis. 2010 Feb. 16(2):238-43. [Medline]. [Full Text]. Djordjevic-Spasic M, Potkonjak A, Kostic V, Lako B, Spasic Z. Oropharyngeal tularemia in father and son after consumption of under-cooked rabbit meat. Scand J Infect Dis. 2011 Dec. 43(11-12):977-81. [Medline]. 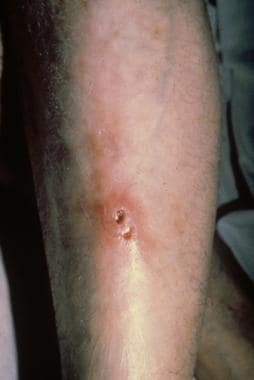 Tularemia associated with a hamster bite--Colorado, 2004. MMWR Morb Mortal Wkly Rep. 2005 Jan 7. 53(51):1202-3. [Medline]. Yuen JC, Malotky MV. Francisella tularensis osteomyelitis of the hand following a cat bite: a case of clinical suspicion. Plast Reconstr Surg. 2011 Jul. 128(1):37e-9e. [Medline]. Keim PS, Wagner DM. Humans and evolutionary and ecological forces shaped the phylogeography of recently emerged diseases. Nat Rev Microbiol. 2009 Nov. 7(11):813-21. [Medline]. [Full Text]. Rydén P, Björk R, Schäfer ML, Lundström JO, Petersén B, Lindblom A, et al. Outbreaks of tularemia in a boreal forest region depends on mosquito prevalence. J Infect Dis. 2012 Jan 15. 205(2):297-304. [Medline]. [Full Text]. Eisen RJ, Gage KL. Transmission of flea-borne zoonotic agents. Annu Rev Entomol. 2012. 57:61-82. [Medline]. Schmitt DM, Barnes R, Rogerson T, Haught A, Mazzella LK, Ford M, et al. The Role and Mechanism of Erythrocyte Invasion by Francisella tularensis. Front Cell Infect Microbiol. 2017. 7:173. [Medline]. [Full Text]. Hansen CM, Vogler AJ, Keim P, Wagner DM, Hueffer K. Tularemia in Alaska, 1938 - 2010. Acta Vet Scand. 2011 Nov 18. 53:61. [Medline]. [Full Text]. Lester Rothfeldt LK, Jacobs RF, Wheeler JG, Weinstein S, Haselow DT. Variation in Tularemia Clinical Manifestations-Arkansas, 2009-2013. Open Forum Infect Dis. 2017 Winter. 4 (1):ofx027. [Medline]. [Full Text]. Stoecker WV, Calcara DA, Malters JM, Clonts M, Everett ED. Tick-borne febrile illnesses lacking specific symptoms. Mo Med. 2009 Jul-Aug. 106(4):304-8. [Medline]. Hornick R. Tularemia revisited. N Engl J Med. 2001 Nov 29. 345(22):1637-9. [Medline]. Fredricks DN, Remington JS. Tularemia presenting as community-acquired pneumonia. Implications in the era of managed care. Arch Intern Med. 1996 Oct 14. 156(18):2137-40. [Medline]. Jensen WA, Kirsch CM. Tularemia. Semin Respir Infect. 2003 Sep. 18(3):146-58. [Medline]. Francis E. A summary of the present knowledge of Tularemia. Medicine. 1928. 7:411-32. Ozsürekci Y, Ceyhan M, Celik M, Kara A, Cengiz AB, Ozgen-Mocan B. Suppurative cervical adenopathy and pharyngeal mass due to tularemia unresponsive to medical treatment. Turk J Pediatr. 2011 Sep-Oct. 53(5):554-7. [Medline]. Thomas LD, Schaffner W. Tularemia pneumonia. Infect Dis Clin North Am. 2010 Mar. 24(1):43-55. [Medline]. Scofield RH, Lopez EJ, McNabb SJ. Tularemia pneumonia in Oklahoma, 1982-1987. J Okla State Med Assoc. 1992 Apr. 85 (4):165-70. [Medline]. Belhassen-Garcia M, Velasco-Tirado V, Alvela-Suárez L, Fraile-Alonso Mdel C, Carpio-Pérez A, Pardo-Lledias J. Cavitary pneumonia and skin lesions. Respir Care. 2012 Mar. 57(3):457-9. [Medline]. van de Beek D, Steckelberg JM, Marshall WF, Kijpittayarit S, Wijdicks EF. Tularemia with brain abscesses. Neurology. 2007 Feb 13. 68(7):531. [Medline]. Mitchell LA, Bradsher RW Jr, Paden TC, Malak SF, Warmack TS, Nazarian SM, et al. Tularemia induced bilateral optic neuritis. J Ark Med Soc. 2006 Mar. 102(9):246-9. [Medline]. Karabay O, Kilic S, Gurcan S, Pelitli T, Karadenizli A, Bozkurt H, et al. Cervical lymphadenitis: tuberculosis or tularaemia?. Clin Microbiol Infect. 2013 Feb. 19(2):E113-7. [Medline]. Svensson K, Granberg M, Karlsson L, Neubauerova V, Forsman M, Johansson A. A real-time PCR array for hierarchical identification of Francisella isolates. PLoS One. 2009 Dec 21. 4(12):e8360. [Medline]. [Full Text]. Maurin M, Castan B, Roch N, Gestin B, Pelloux I, Mailles A, et al. Real-time PCR for diagnosis of oculoglandular tularemia. Emerg Infect Dis. 2010 Jan. 16(1):152-3. [Medline]. [Full Text]. Johansson A, Berglund L, Eriksson U, et al. Comparative analysis of PCR versus culture for diagnosis of ulceroglandular tularemia. J Clin Microbiol. 2003. 38:22-26. [Guideline] ASM. Sentinel Level Clinical Laboratory Guidelines for Suspected Agents of Bioterrorism and Emerging Infectious Diseases. asm.org. Available at https://www.asm.org/images/PSAB/LRN/Tularemia316.pdf. 2016 March; Accessed: August 27, 2018. Enderlin G, Morales L, Jacobs RF, Cross JT. Streptomycin and alternative agents for the treatment of tularemia: review of the literature. Clin Infect Dis. 2004. 19:42-7. Cross JT, Jacobs RF. Tularemia: treatment failures with outpatient use of ceftriaxone. Clin Infect Dis. 1993 Dec. 17(6):976-80. [Medline]. Weber IB, Turabelidze G, Patrick S, Griffith KS, Kugeler KJ, Mead PS. Clinical recognition and management of tularemia in Missouri: a retrospective records review of 121 cases. Clin Infect Dis. 2012 Nov 15. 55 (10):1283-90. [Medline]. [Full Text]. Calin R, Caumes E, Reibel F, Ali Mohamed A, Brossier F, Foltz V, et al. Severe glandular tularemia in a patient treated with anti-tumour necrosis factor for psoriatic arthritis. Int J Infect Dis. 2017 Jul. 60:1-3. [Medline]. [Full Text]. Pérez-Castrillón JL, Bachiller-Luque P, Martín-Luquero M, Mena-Martín FJ, Herreros V. Tularemia epidemic in northwestern Spain: clinical description and therapeutic response. Clin Infect Dis. 2001 Aug 15. 33(4):573-6. [Medline]. Jellison WL. Tularemia: Dr. Edward Francis and his first 23 isolates of Francisella tularensis. Bull Hist Med. 1972 Sep-Oct. 46(5):477-85. [Medline]. Trevisanato SI. The 'Hittite plague', an epidemic of tularemia and the first record of biological warfare. Med Hypotheses. 2007. 69(6):1371-4. [Medline]. Wherry WB, Lamb BH. 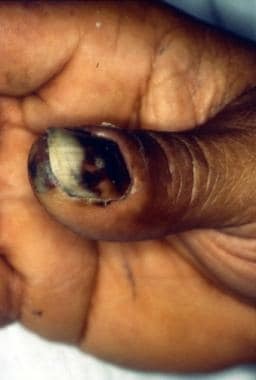 Infection of man with Bacterium tularense. J Infect Dis. 1941. 15:331-40.